Team Flash decides that they must journey to the past to defeat Cicada in the future. Our reviews of Season 5 The Flash episodes “The Icicle Cometh,” “O Come, All Ye Thankful,” and the 100th episode “What’s Past is Prologue”! The episodes leading up to The Flash’s 100th episode, focussed very closely on family. In “The Icicle Cometh” (Season 5, Episode 6), Caitlin was reunited with her father, as Cisco used the satellites to find the black ops site Thomas snow was located. All were surprised when they arrived to find Thomas seemingly alive and well. In order to mitigate his ALS, Thomas had been experimenting on himself. When things went badly, he quarantined himself to keep everyone safe. From what…? Yet the bigger reveal was that, since ALS was genetic, Papa Snow had experimented on Caitlin, as well. Killer Frost was the byproduct. INTERESTING. So, it shouldn’t surprise us to know that Thomas had his own alter-ego. Icicle intended to completely wipe out Thomas… and just before he was able to succeed, Killer Frost reemerged when Caitlin broke her DeVoe-induced mental block. Elsewhere, (with Sherloque’s assistance), Iris and Nora were able to team up to recover the satellite core that had impacted Cicada on the night of the Enlightenment. Finally, an unexpected, but much appreciated team-up between Cecille and Ralph produced the information about Cicada’s daughter, Grace. In “O Come, All Ye Thankful” (Season 5, Episode 7), Team Flash celebrated Thanksgiving. The episode also featured a heavy dose of father-daughter drama! Barry and Nora were in conflict, as she abhorred the personal risks her father repeated took in order to be a superhero and save the world. *CRIES* But in the end, Barry was able to demonstrate that “I’m The Flash for my family…” and Nora understood. Finally, in a set of flashbacks, we saw the difficult relationship between Orlin and Grace, who was thoroughly disappointed in his ability to parent. Just as Orlin was able to turn things around and make a stable home for them, things went wrong. One year after Orlin promised to make the world better for Grace, it was at a carnival on the night of the Enlightenment that she was hurt. So by the time we reached “What’s Past is Prologue” Team Flash was determined to finally come up with a way to take down Cicada. The episode kicked off with Ralph and Sherloque tailing Orlin Dwyer (Cicada) and gathering information to bring back to the team. They revealed that Grace is actually Orlin’s niece and she was harmed on the night of the Enlightenment. There was a lot of frustration because they just couldn’t figure out how to get around Cicada’s dagger. They needed a dagger-dampener, of sorts. And Nora’s question would guide the remainder of the episode as Team Flash sought to do just that. In order to create such a dark matter object, they would need part of Savitar’s suit, the Speed Force transmitter gun that Zoom used to steal Barry’s speed, and then infuse the objects with dark matter from the night of the Particle accelerator explosion. Once the dagger dampener was created, they’d leave it in a hiding place in the past… a place where they would find it in the future in order to help them defeat Cicada. Yes, we’re going to the past y’all!!! At first, Barry didn’t want Nora to come with him. The threats from Savitar, Zoom, and Thawne all loomed large. But, interestingly, Iris believed that Nora should go… Team Flash had already defeated all those villains. Barry eventually came around, and the plan was on. To the Speed Force! FIRST STOP: Barry and Nora arrived at the night Barry phased into Savitar’s suit and destroyed him, there to collect a couple pieces of his suit. Unfortunately, as soon as they arrived, they’d already caught the attention of a time wraith. Barry headed back to the Speed Force to distract the time wraith, while Nora got the shards of Savitar’s suit. Nora was able to do just that, but she was slightly distracted by Iris’s arrival, badass with a gun, to kill Savitar. Nora joined Barry, where they were able to outrun the time wraith. SECOND STOP: Barry and Nora arrived on the night Barry lost his speed to Zoom in order to collect the Speed Force transmitter in the melee. At first, the gun seemed to have disappeared, but Harry Wells returned with it, highly upset about the Zoom situation and finding his daughter. When Barry suggested a plan on how to find Jesse Quick, Harry handed over the Speed Force transmitter and went about his business. Elsewhere, Nora got another new perspective of her mom… this time as she encouraged Barry after their Zoom attack. Unfortunately, before Barry and Nora could leave the timeline, Zoom returned and he had his eye on Nora, another speedster! Zoom chased them into the Speed Force, and just before he was able to get his hands on Barry, the time wraith struck and took Zoom out. Time wraith FTW!!!! However, Barry accidentally dropped the Speed Force transmitter in the kerfuffle! THIRD STOP: Barry and Nora arrived at the night the Particle Accelerator exploded at Star Labs. They were able to hide in the secret room with Gideon and Barry asked Gideon to redirect a sample of dark matter to that room to collect it. While they waited, Barry was clearly agitated about all these moments from the past that they’d visited. It culminated in him telling his daughter that Eobard Thawne killed Nora Sr. in order to prevent him from becoming a speedster. Nora was sufficiently chastened. After the Particle Accelerator exploded, Gideon was able to retrieve the dark matter and the dagger dampener was complete. Before returning to their timeline, Barry and Nora left the device embedded in one of the stone pillars near the hospital (where Orlin/Cicada visits Grace). We also saw that the same doctor who was helping Cicada and Grace in the present was there the night of the particle accelerator explosion, when both Wells/Thawne and Barry arrived after their accidents. 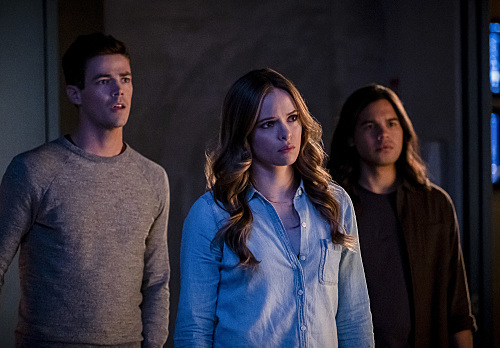 When Barry and Nora returned to the present, Team Flash gathered themselves for the attack. Barry arrived at the hospital and, upon sight, Cicada joined him outside. Clearly, Cicada believed different because after he killed all metas, he planned to kill himself, too. Now that’s dedication to a cause! In the resulting conflict, we saw that the dagger dampener worked! Cisco was able to them send the dagger through a breach into outter space. All was well… until we saw that Cicada could call the dagger back to himself like Thor calls mjolnir. WOWSA. Everyone was affected… Flash, XS, Vibe, Elongated Man. Even Caitlin and Sherloque were knocked down. But then Killer Frost emerged! Since she wasn’t created by Dark Matter, Cicada’s dagger didn’t have any effect. Killer Frost blasted Cicada and he retreated. Killer Frost will be their best weapon! Meanwhile, over the course of the episode, Sherloque stole Nora’s journal and noticed that she wrote in her journal using the code that Barry was writing in when he came out of the Speed Force. Nora retrieved the journal from Sherloque, and also revealed that she was the one who came up with the language. The episode ended with Nora going back in time to watch Harry and Nora together, laughing on the porch of their home. Barry joined Nora and reminisced about his parents. (Obviously, no one has told Nora about that one time Barry did go back in time to save his mother… AKA FLASHPOINT!) Nora and Barry race each other home. 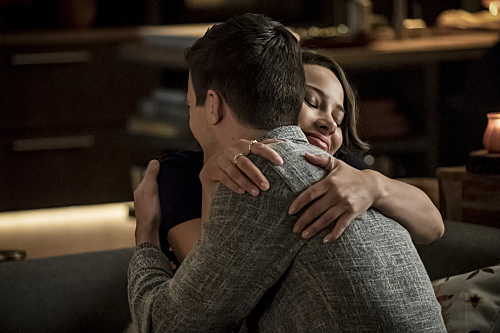 And much later, Nora is alone in the hidden room with Gideon to upload and transmit notes in her journal to someone… and when Nora travels to 2049 to deliver a personal message to a person locked away in a Star Labs cell… it’s Thawne/Wells! Nora, girl, what are you doing???!!! Finally, setting up the Elseworlds crossover special, Flash (John Wesley Shipp) loses a large book to an alien being, Mar Novu (LaMonica Garrett). The Flash airs Tuesdays at 8p/7c on The CW.